2 Far-Right Rallies In SF Bay Area Fizzle While Counterprotesters Rejoice : The Two-Way Both rallies were canceled Friday. One organizer attempted to hold a press conference on Saturday instead but abandoned that plan after police cordoned off the location. 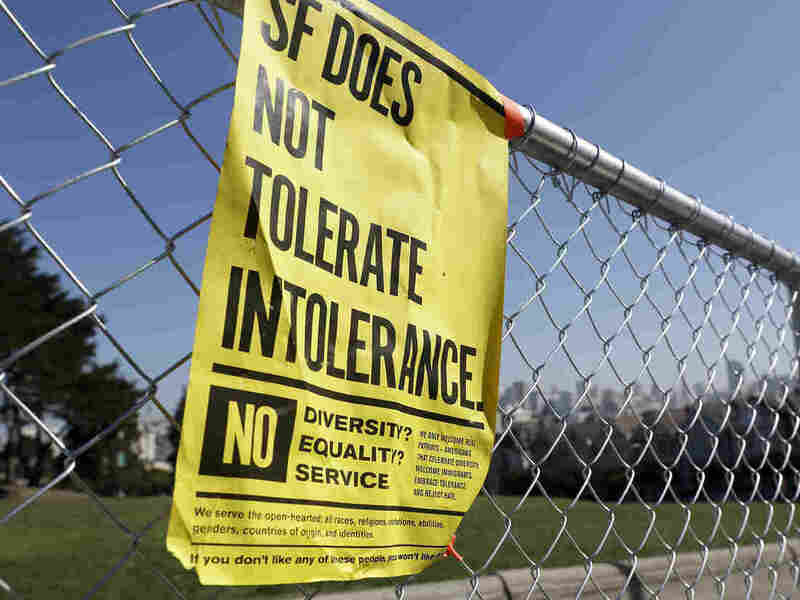 A fence blocks an entrance to Alamo Square Park in San Francisco on Saturday, where officials took further steps to prevent violence ahead of a planned news conference by a right-wing group. It was all, in effect, over before it even began. In the face of overwhelming popular and political opposition, a far-right activist canceled a press conference hastily scheduled for Saturday afternoon that some feared would provoke violent confrontations in the heart of San Francisco. This came less than 18 hours after organizers also called off two highly publicized right-wing rallies planned for the Bay Area this weekend. Counterprotesters arrived Saturday morning prepared to rebuke their opponents with signs and slogans. When the press conference never materialized, the crowds — relishing the turn of events — simply celebrated en masse. 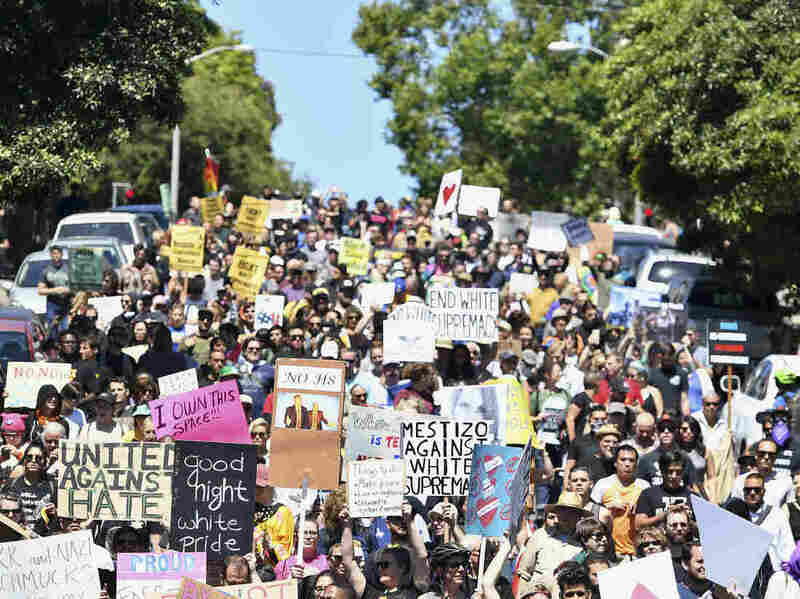 Protesters march through San Francisco on Saturday while officials took steps to prevent violence ahead of planned events by a right-wing group. San Francisco police announced Saturday afternoon that they had seen no major incidents and made only one arrest. The organizers behind Saturday's scuttled events later decried the political left and the media for unfairly labeling them racists and undermining the demonstration. Counterprotesters rejoiced after San Francisco police closed Alamo Square Park. Following the violent white supremacist rally two weeks ago in Charlottesville, Va., where one woman died, many Bay Area locals ranged from nervous to indignant ahead of the two planned far-right rallies. The first, hosted by a conservative group known as Patriot Prayer, was to take place on Saturday afternoon in Crissy Field, with the Golden Gate Bridge as the backdrop. A separate gathering, dubbed the "No to Marxism" rally, was scheduled for Sunday in Berkeley, Calif.
Patriot Prayer, led by Joey Gibson from Portland, Ore., has held events along the West Coast, drawing white supremacists and violence, according to the Southern Poverty Law Center. Gibson, who condemned white supremacism and neo-Nazism at a recent rally, says his group is not racist in nature. The SPLC does not list Patriot Prayer as a hate group. 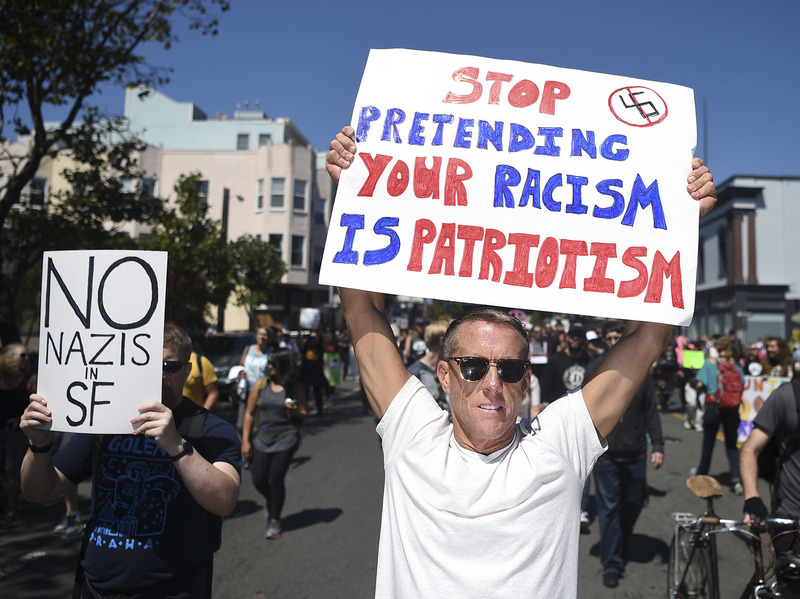 Many in San Francisco were disappointed on Wednesday when the National Park Service approved the permit for the Patriot Prayer event. David Criswell joins the anti-white nationalist march that morphed from a counterprotest to a celebration in San Francisco. Mayor Ed Lee said in a statement that "the shameful, anti-American trend of hate-filled extremist rallies will unfortunately be allowed to continue this weekend in our city." House Minority Leader Nancy Pelosi, D-Calif., said she "had grave concerns about the public safety hazard ... by permitting a white supremacist rally." However, as KQED reports, anger from locals did persuade the park service to help the rally opponents' cause in one important way: a list of prohibited items. While officials couldn't stop these political actors from using their sets of choice, they have seriously curtailed their ability to record and livestream the action. In San Francisco, for example, selfie sticks, camera helmets, drones, tripods and large bags that often hold over-the-shoulder cameras would not be allowed in the demonstration area. By Friday evening, the pressure against the demonstrations had become too much, and they were called off. Gibson of Patriot Prayer canceled his Saturday event, citing safety. "We're not going to have a rally at Crissy Field," he said. "At the end of the day, we want people to be safe." Gibson, however, was not finished. On Friday, as he canceled his rally, he announced he would still convene a press conference at 2 p.m. Saturday in San Francisco's Alamo Square Park. But Gibson did not have a permit for the park. The city of San Francisco, recognizing this, countered by closing Alamo Square Park. By Saturday morning, the police had fenced off the area and heavily surrounded it with officers. Gibson responded via his Facebook page that he would now instead hold an "indoor" press conference at 2 p.m. Gibson did later livestream a Q&A on his Facebook feed from a dark room, conducted by an unidentified interviewer. 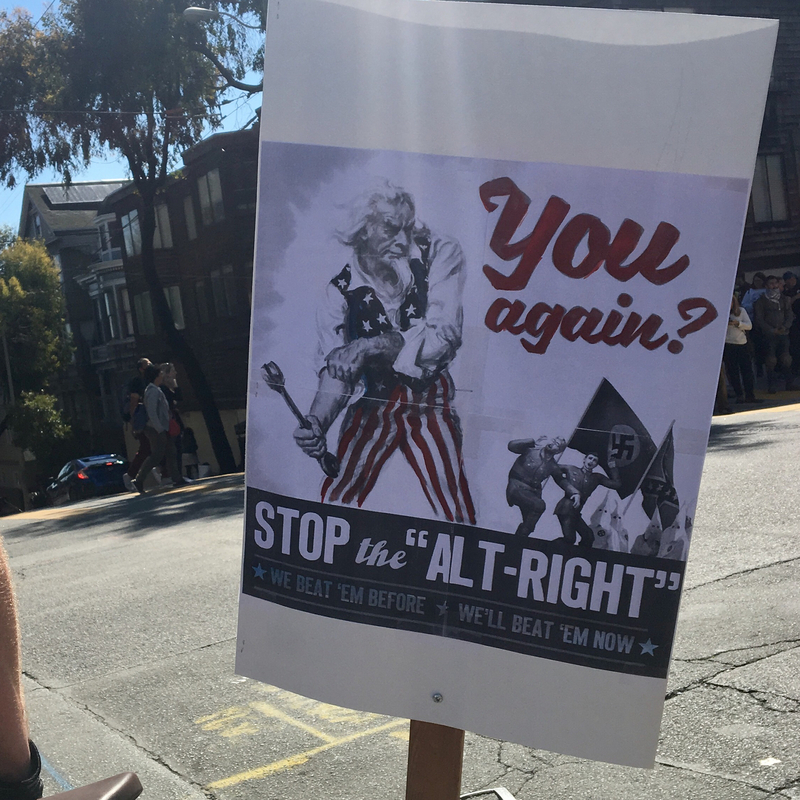 At Alamo Square Park and elsewhere in the city, counterprotesters, who had shown out in large numbers, rallied and rejoiced. Many saw the weekend, ultimately, as a win. "Anytime we show we're not going to hide and that we are united for an America that doesn't tolerate hate, this is absolutely a victory," Andrea Smith of Santa Clara, Calif. told NPR's Eric Westervelt. San Francisco's push against the right-wing rallies took many forms, including an event at the Civic Center, not billed explicitly as a protest, that gave participants a place to engage in everything from yoga to blowing bubbles. Later in the day, Patriot Prayer members held a sparsely attended press conference south of the city, where they lamented what they saw as their portrayal in the media and strong opposition from local politicians. Elsewhere Saturday evening, protesters from Gibson's group and counterprotesters congregated in close proximity at Crissy Field, sparking heated arguments. Police intervened and appeared to prevent any further confrontation. Facing the sun at a late afternoon news conference, San Francisco Police Chief William Scott told reporters that the day had ended with no major incidents and only one arrest (for public intoxication). "What you saw today is a city that came together," he said.